“Kiernan’s accounts ring with authenticity.…The Girls of Atomic City is fascinating." "As most of us are all too aware, the generation who fought in World War II or supported the effort from home are leaving us -- their children, grandchildren, and greats -- to carry on without them. Thanks to author Kiernan, we hear from a group of that generation's women, now in their eighties and nineties, whose wartime experience matched no one else's. Ever. Anywhere." 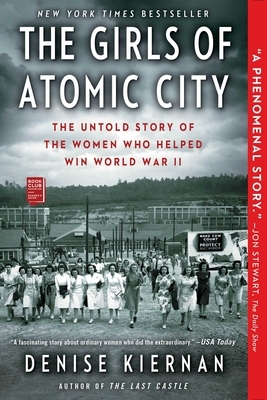 "A lively story about the tens of thousands of women who made the bomb -- from the power-plant janitor struggling each day through the mud to the exiled physicist in Sweden -- The Girls of Atomic City offers a bottom-up history revealing that the atomic bomb was not simply the product of J. Robert Oppenheimer's genius, but also of the work of women at every level of education and class."